While big data is all the buzz, many traditional business intelligence cannot keep up with the volume it creates or how to supply decision makers with quick, actionable information from it. This report from Frost & Sullivan looks at the challenges, and a new approach to business intelligence that can better harness big data. Big data is only as useful as it can be analyzed and reported on. Traditional business intelligence (BI) solutions have not kept pace with the massive amounts of data or the need for decision-makers to have quick, actionable information. 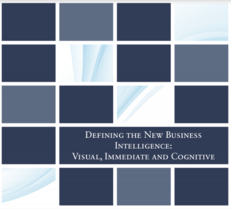 Download this Stratecast report from Frost & Sullivan that looks at the challenges businesses face around business intelligence, and how a new approach to BI is needed that can not only cost-effectively handle big data, but be interactive, intelligence and dynamic.